Yesterday, our shareholders concluded their vote as to which system(s) I should bring into the fold next. The vote was somewhat close, but they decided to go with Kino, an ice mining system a few jumps from our capital at Halaima. You can see the results of the vote in the vote thread. Check the Maps section on this website to have a look at the different options they had and the relative position of Kino to our preexisting territories. Totally excessive. I shook my head and went to work putting up my containers to announce the new regime. Kino actually has two ice fields, so I put four of them in the ice field with miners, and three in the other one. There was only one group of miners in the ice field when I showed up, so I took a closer look. 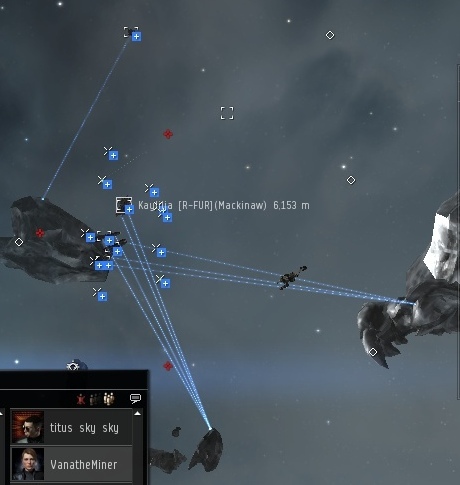 It was a standard many-alts or botting setup, 1 orca and 5 mackinaws. The macks were clumped together like bowling pins. Look at that mess. 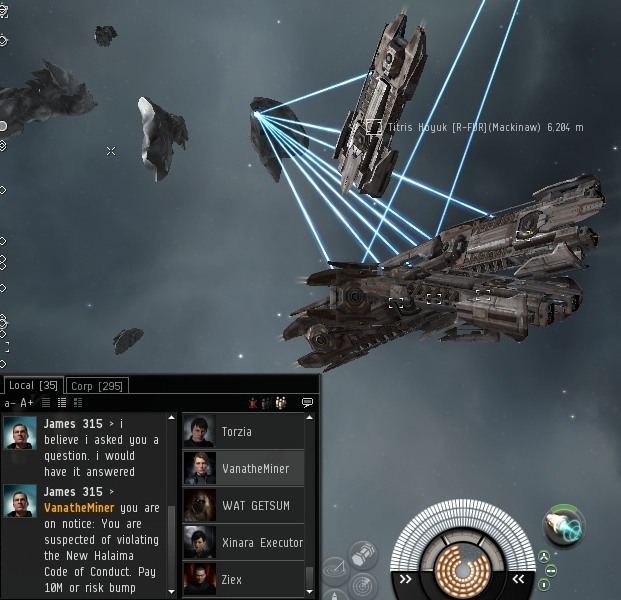 I notified the orca pilot of my displeasure and asked what was going on. No answer. Clearly, an AFK miner. A ludicrous number of cans everywhere and a bunch of silent alts. Was this the kind of culture Kino would lower itself to? Not on my watch. After just a little bit of bumping, the miner returned to her keyboard and I notified her of this website and the changes that would need to be made. 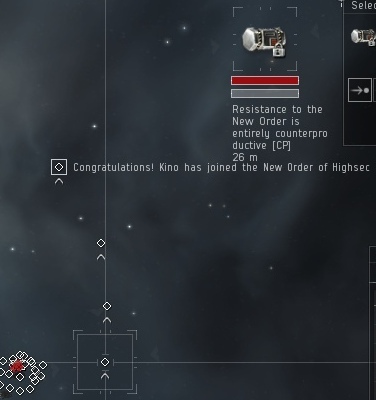 For starters, she could comply with the New Halaima Code of Conduct by paying me 10 million isk for all the mining characters (I usually leave orcas/industrials alone, since technically they don't mine). Success. Literally within minutes of arriving at Kino, I had my first payment. Clearly these people are more civilized than the miners of Kamio, which held out for a week. With positive standings arranged, I kept to my word (as I always do) and ceased bumping. This is the sight of a pacified system: Code-compliant miners, all clad in blue. 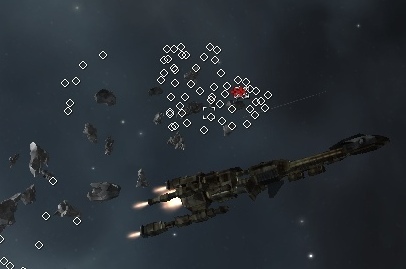 A local arbitrator pilot who was apparently guarding the ice field showed up. 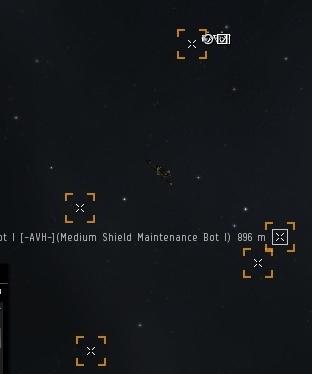 As if to crown me, he sent some shield maintenance bots to boost me. I am pleased with the people of Kino so far. Is this a sign of things to come? We'll see.